Krewe de Fu presents its 6th annual Twelfth Night masquerade Future Laser Attack! Entertainment will include martial arts, burlesque, immersive special effects, props and live DJs. 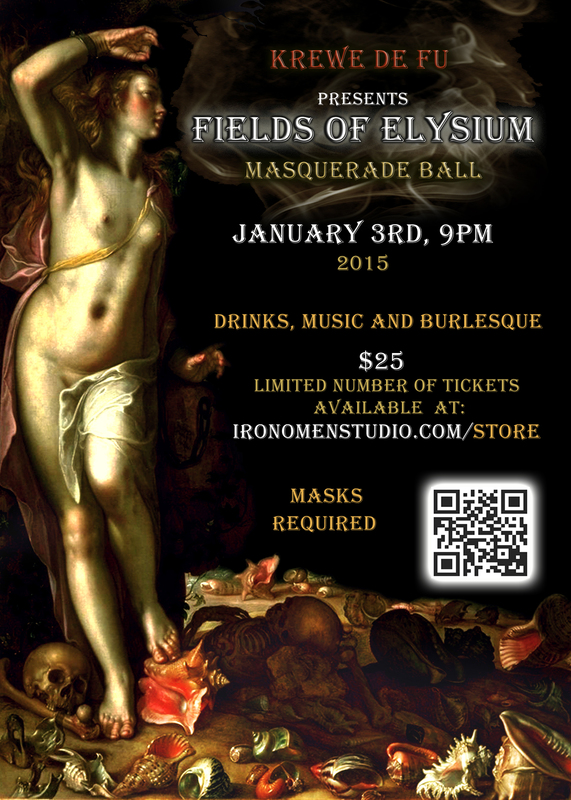 Costume (or at least a mask or face paint) is required for entrance. $25 donation in advance or $30 at the door. Drinks and show are included. Guests will be limited to 150 so reserve your spot now! When you donate your name will be added to the list at the door, no need for a physical ticket. Get your ticket at the door! Additional DJs and Performers will be announced soon! Krewe de Fu presents its fifth annual 12th night masquerade Six Legged Freaks. Entertainment will include contortion, burlesque, immersive special effects, props and live DJs. Costume (or at least a mask or face paint) is required for entrance. Anything insecty, from Spider-man to Orkin-man, is fair game. $25 donation in advance or $30 at the door. Drinks and show are included. Guests will be limited to 150 so reserve your spot now! When you donate your name will be added to the list at the door, no need for a physical ticket. Online donations are now closed! but don’t worry, you can still make your contribution at the door. See you tonight! We’ll be hosting our fourth annual Krewe de Fu Twelfth Night Ball on Saturday, January 16th, 2016. This year’s theme is “Feathers & Leather”, Mayan-inspired and motorcycle-adjacent. We will feature warrior games, various performers, live DJs, and all the fun and mystery and spectacle you’ve come to expect from the Krewe de Fu. Online ticket sales have closed. Tickets will still be available at the door for $30. See you there! Plans are well underway for Krewe de Fu’s 3rd annual Twelfth Night Ball. This year’s theme is “Fields of Elysium”. Event details are available on our Facebook Event page, which will continue to be updated in the weeks leading up to the ball. If you have any questions about the event, feel free to post there and one of the Krewe’s Court members will respond to you. Please note that RSVPing on this event page does NOT guarantee you entry to the event, you must purchase a ticket at the link below. We strongly encourage you to buy your tickets early, because while invitations while not be required for this year, admission tickets will be limited to a total of 150 people. Tickets are $25 in advance and $30 at the door, but we can’t guarantee we will have any left to see at the door. Proceeds from the tickets will help support the creation of props and other ball expenses up front. If you’ve been to one of our previous balls, you know that we go all out, and this year is no exception!